We are a leading Manufacturer of personal lockers with 4 door, personal locker, personal locker doors powder coated and storage lockers from New Delhi, India. With a firm commitment to quality, we are manufacturing, wholesaling, trading, retailing and supplying a vast range of fine quality Personal Lockers with 4 Door. Offered lockers are manufactured with the use of quality-tested steel by employing highly advanced technology in tandem with set market norms. The offered lockers are suitable for keeping precious items and documents in offices, hotels, medical centers & banks. Our esteemed clients can avail these lockers from us at market leading rates. With a firm commitment to quality, we are manufacturing, wholesaling, trading, retailing and supplying a vast range of fine quality 5 Door Personal Locker. Offered lockers are manufactured with the use of quality-tested steel by employing highly advanced technology in tandem with set market norms. The offered lockers are suitable for keeping precious items and documents in offices, hotels, medical centers & banks. 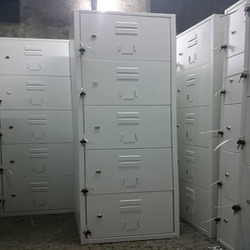 Our esteemed clients can avail these lockers from us at market leading rates. With the constant support of our dexterous crew of professionals, we are fulfilling the varied requirements of clients by offering Personal Locker Doors Powder Coated (1, 2. 3, 4, 5, 6, 8 ) that is critically appreciated by clients for their efficient performance and durable nature. This locker is manufactured from finest grade metal and advanced technology by our skilled experts. 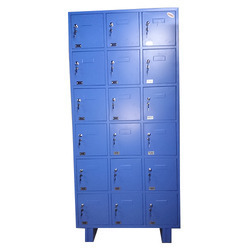 Offered locker is highly used in banks, government offices and post office for storing files and documents.